Traditionally, the sportscar concept embraced lightness and simplicity – a less is more approach. Increasingly, though, the makers of the BMW X5 M from Munich and Porsche Cayenne Turbo from Stuttgart – together with Affalterbach arch rival Mercedes-AMG – threaten to burst the conventional ‘sportiness’ pigeonhole at the seams plying extensive feature lists, excess in luxury and extremes of high performance in formulating their range-leading Sport Utility Vehicles. Unlike the luxurious-focused iron-fist-in-velvet-glove approach of the Land Rover Discovery, or the inoffensively neutral pitch of Audi’s Q7, the consensus among Europe’s premium elite brands seems to be that, when money is of little object, outrageous engine outputs, physics-bending handling and tangible links to more thoroughbred hero models are essentials in separating the haves from the have-everything family hauler experience. At $185,900 plus on-roads, the just released, second-generation ‘F15’ X5 M is over twice the price of the ($82,900) entry-level sDrive 25d version of the X5 range. It is, however, $8800 shy of BMW’s absolute range-topping, slightly less sensible X6 M.
Porsche’s closest nemesis on balancing both price and spec is the Cayenne Turbo, which benefitted from a mid-lifecycle refresh late last year. At $230,800 plus on-roads, it’s a long slog up the fiscal ladder from the entry ($104,700) Cayenne Diesel, though $53,900 short of all the Porsche SUV money can buy, the Turbo S.
Our Carrera White Metallic Cayenne Turbo is fitted with 11 added extras, from the prowess enhancing (Torque Vectoring Plus at $3590) to the more aesthetically pleasing (Garnet Red seat belts, $1090). Those ‘911 Turbo Design’ 21-inch wheels, bundled with wheel arch extensions, at $4110, tip the as-tested price over the quarter-mil mark. The Melbourne Red Metallic X5 M adds just three cost options totaling $9200, which includes high-spec ‘merino’ leather trim with Alcantara headlining ($7800) and second row sun blinds ($500). Interestingly, BMW wants $900 for soft-close doors, while Porsche asks $1790 for the same optional nicety. 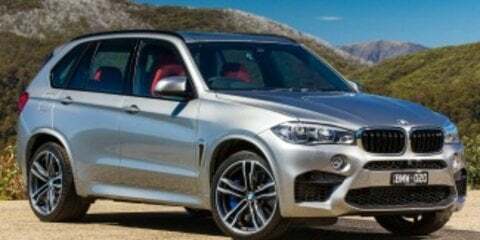 At 50 paces, the X5 M is certainly more muscular in appearance and wears its performance stripes more conspicuously. Both, though, present subtle yet sophisticated styling updates, refreshingly tauter designs that are less noticeable in isolation than they are parked next to their predecessors. The Cayenne in particular, with its 911 hints, appears tauter and more compact than the version it replaced in 2014. The BMW, particularly in its more three-dimensional front fascia, is more characterful than the old E70 crop. Working against the jumbo-sized M car’s sportiness pitch is the ride height, specifically the unsightly tyre-to-wheel arch gap that could swallow a moderately sized dog. The old on-stilts SUV convention remains, though not to a dramatic degree. The theme repeats in the cabin, where the X5 M’s seating is higher set – as many owners prefer – than the Cayenne, which not only offers a lower-slung seating position adjustment but more exaggerated ‘sportier’ bolstering. Behind the wheel, the Porsche is a little more cocoon-like and less airy than the ambience inside the BMW. Both offer ample all-round vision. It’s more than the dripped-in-red-leather trim choice making the Porsche feel more opulent inside. From the quality of the stitching to the metal look – though not necessarily metallic feeling – details presentation is impeccable. It is, though, very busy, particularly the like-it-or-loathe-it button fetish in the centre stack. The Cayenne’s modest seven-inch screen, its infotainment content and user interface all feel a bit old hat, especially compared with the BMW’s slick iDrive functionality, the grandiose 10.25-inch display and high-end Navigation Professional, which features a very handy new-gen Real Time Traffic Information functionality in the sat-nav. The X5 M’s less ostentatious interior design – perhaps deceptively due to the blackout ‘colour’ choice – is simpler and cleaner, though richly presented and quality in feel. It’s more ‘classic’ than adventurous, which may suit many buyers’ tastes. However, the optional merino full-leather upholstery – at $7800 extra remember – isn’t quite as sumptuous as the standard issue perforated trim in the Porsche. The heated BMW front seats also lack the Porsche’s added cooling functionality. The Porsche’s second-row seating is more sports-stylized, with three-position seat back adjustment in outer seating positions, the accommodation feeling more aligned in design with the front row appointments. The BMW’s flatter rear seating feels more utilitarian by contrast, though it’s slightly roomier for head and knee space and has a higher degree of individual passenger air con adjustment. At 670 litres, the Porsche can swallow 20 litres of extra volume in the cargo area seats up. Both SUVs offer a 40:20:40 rear seat split and, folded flat, the BMW offers a superior 1870L of luggage space versus the Cayenne Turbo’s 1705L. Both SUVs offer four luggage tie-down points, though only the BMW’s adopts adjustable hook positioning via rails (the Porsche’s are static) and provides a handy split-opening tailgate design. Both protagonists have arguably surpassed a tipping point of providing higher engine outputs than most SUV buyers need or might regularly use – their measures defy rationale. But, of course, more is more – the larger the numbers, the bigger the bragging rights and the higher the justification of formidable price-tags. The BMW brags the loudest. At 423kW, the BMW’s 4.4-litre twin-turbocharged V8 offers 41 extra kilowatts over the Cayenne Turbo’s larger capacity 4.8-litre eight cylinder (and even supplants the top-tier 419kW Turbo S in the muscle flexing department). Both offer 750Nm of maximum torque, though the X5 M’s 2200-5000rpm peak band is, on paper, broader than the 2250-4000rpm range offered by the Cayenne Turbo. Advantage Munich. Fuel consumption claims are also very close with – surprise, surprise – the BMW claiming a slightly more favourable 11.1L/100km to the Porsche’s 11.5 figure. It’s game to BMW. However, on test and in less-than-indicatively real world conditions, both SUVs managed a near-enough-to-identical 18-plus-litres-per-100-kilometre figures. That said, both vehicles’ trip computers indicated low-teens frugality during light-load highway cruising. The most powerful series production BMW you can currently buy also comes with a seriously impressive 0-100km/h claim of just 4.2 seconds, three-tenths quicker than the basic Cayenne Turbo, two-tenths swifter than one Sport Chrono equipped. For chest-thumping pub banter at least, Munich takes the set. By the seat of the pants, though, both are similarly and ferociously quick. Any suggestion the extra 90 kilograms of heft the 2275-kilogram X5 M carries over the Porsche levels the performance playing field are pure semantics. Both SUVs have on-tap potency of such eye-opening magnitude that, when fully uncorked, sensible and responsible on-road application evaporates. It’s a very short and close race to the foul dark side of any Australian speed limit. There are greater differences in character and drivability in urban driving situations, though neither seems to need much beyond 2000rpm for the bulk of commuting, 3000rpm is ample for urgent transit, while swinging tacho needles north of four grand with regularity can be downright antisocial. While both SUVs offer ample breadth of drive mode selection to sharpen or soften reflexes, it’s the BMW that offers the most bipolar Jeckyl and Hyde-like character transitions with no more than a squeeze of the throttle. The X5 M is quite eager off the mark and its V8 is slightly laggy to initial throttle application, demanding concentrated driver effort to prevent it lunging in bumper-to-bumper traffic. In every other driving situation, particularly on the move, it’s extremely linear in torque delivery mid-range and revs with urgency, complete with satisfying howl to redline. The Cayenne Turbo, however, is a little more benign under the right foot in its default ‘comfort’ drive setting. It’s easier to maneuver at low speed, smoother of the mark and more relaxed in peak hour traffic. It becomes markedly sharper in Sport mode, while the degree of man-the-battleships aggression when Sport + – exclusive to the Sport Chrono option – is selected is, frankly, alarming in the most positive sense. Both all-wheel-drive SUVs use ZF-sourced, torque converter-equipped eight-speed automatic transmissions. Both offer responseive, rapid-fire paddleshifted upchanges and downchanges in the heat of battle, and self-shift intuitively when left in to their own devices, but the Porsche’s transmission is noticeably smoother in operation across the balance of all driving conditions. BMW, however, seems to have intentionally chosen a calibration mimicking the twin-clutch transmission attributes. It’s less than seamless at times, with some low-speed jerkiness and abruptness in ratio changes. It seems to disengage drive at idle, causing rollback on inclines and demanding automatic hill-holding be activated. Strange. Both BMW and Porsche promote race circuit friendliness with their respective hyper-SUV breeds, the former name checking Laguna Seca in marketing, the latter most recently boasting record-breaking Nordeschleife times – the traditional petrolhead yardstick for extreme production car performance. While it’s true few, if any, owners would use either SUV for track work, what’s implied is that lofty levels of grip, composure and driver engagement provide heightened levels of inherent on-road safety. Surely any 2.3-tonne SUV engineered to confidently approach its 279km/h top speed on a German autobahn, as the Cayenne Turbo is, can tackle any Australian highway speed with consummate safety and ironclad ease. No surprises, then, that the limits of either SUV’s grip and road-holding talents are difficult to breach in any responsible manner on twisty country roads, short of entering tight corners with too much speed. Their dynamic characters do differ. Grab its scruff and the X5 reveals shades of true M-car DNA in its balance and handling responses. It’s a little keener to track a chosen line, a little more assertive in changes of direction. Its formidable mass is ever-present, though it never seems to rob poise from the dynamic equation. It feels lighter on its rubber than you expect. Like the X5 M, the Cayenne Turbo’s sheer size makes it a little tricky to place on tighter roads. It lacks a little of the BMW’s dynamic friskiness, though the upshot is a slightly more planted manner that’s a little more surefooted at a brisk pace. Where the Porsche trumps the BMW is in the steering department, at least in the heat of the battle where it’s the clearer and more communicative system. During parking and three-point turns, though, the Cayenne Turbo is quite heavy, almost laborious, and to a degree that might be a deal-breaker for some buyers. The X5 M’s steering is much lighter and friendlier during the low-speed stuff and gains weight with increased speed. That said, activating Sport or Sport + modes seems to do little other than add layers of synthetic weight to the steering assistance. The X5 M’s slightly racier characteristics don’t necessarily make it the finer and fitter all-round SUV experience. But given the BMW markets its flagship family hauler purely as an on-road – or, more accurately, a sealed-surface – device with no off-road pretensions, the jumbo-sized M car delivers what’s promised ‘on the box’. 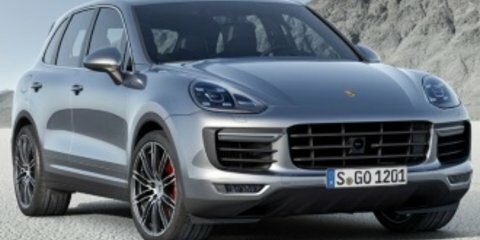 The Cayenne Turbo, however, has standard fitment air suspension that’s height adjustable for added ground clearance; its all-wheel-drive system offering dedicated modes tailored for off-road use. The X5 M, however, adopts a steel sprung front and air sprung rear arrangement with no height adjustment. And where the X5 M wears tarmac-focused Michelin Pilot Super Sport rubber – complete with oh-so M car narrower-front (285mm) wider-rear (325mm) tyre width stagger – the Cayenne Turbo sits on 295mm-wide Michelin Latitude Sport 3 boots designed for more multi-surface use. Sat on humongous 21-inch wheels, these rivals both have a slightly fidgety ride quality over small, high-frequency bumps, though, across the balance of varied road imperfections and with dampers set to their most comfortable settings, both demonstrate fine damping control and compliant ride comfort. Considering how wide their low-profile tyres are, too, neither SUV’s front end wants to unduly pull towards depressions in the road surface. Given its (optional) tyre fitment – 19s are standard – the jury is out on just how far off the beaten track our Cayenne Turbo test car could comfortably venture. But needless to say, some added off-road functionality and the versatility it provides goes some way to justifying a chunk of its $45-odd premium over the BMW. Though their ‘more is more’ pitches leave both hyper-SUVs wanting for very little, value – that $45K question – certainly creeps into the bottom line. Yes, the Cayenne Turbo is slightly more flexible in offering a degree of off-road adaptability, but both hang their ultimate heroics, beyond their myriad niceties, on tarmac-tearing prowess. And it’s the X5 M that nails its promise most confidently…lightness and simplicity be damned.